Let the adventure begin. Discover some amazing boulders and sights you won’t come across every day, like SugarLoaf Mountain – an easily accessible mountain in the middle of a lake. Leave no stone unturned. You’re guaranteed to find more adventures than time permits. If your idea of an action getaway includes pushing the limits of daylight as you squeeze in every outdoor activity, The Bay awaits to show you its treasures! It doesn’t matter how much time you have, because you can pack more outdoor activities into a long weekend than non-adventurers can do in a week! 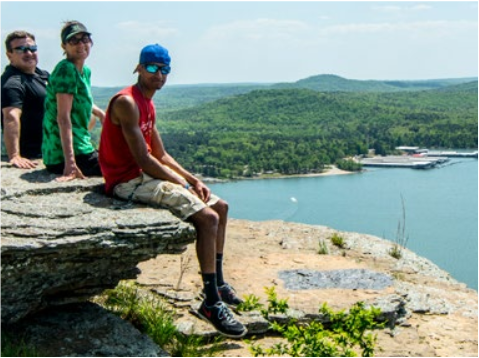 Fairfield Bay is a perfect fit for your lifestyle, offering more than 30 miles of trail system to hike and bike in the Ozark Mountains. In between, you’ll discover plenty of water activities–whether it’s kayaking into remote coves or using a Stand-Up Paddle Board to enjoy the view. 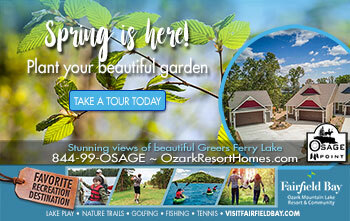 The Bay is a natural paradise in the Natural State, with 340 miles of shoreline along picturesque Greers Ferry Lake. The adventures are here for the taking, so go ahead. While the first day seems short for others, you’ll make it a long one, squeezing in as many activities as possible before bedtime. It starts with setting up camp and races into hiking, cooking out, stargazing and lights out. 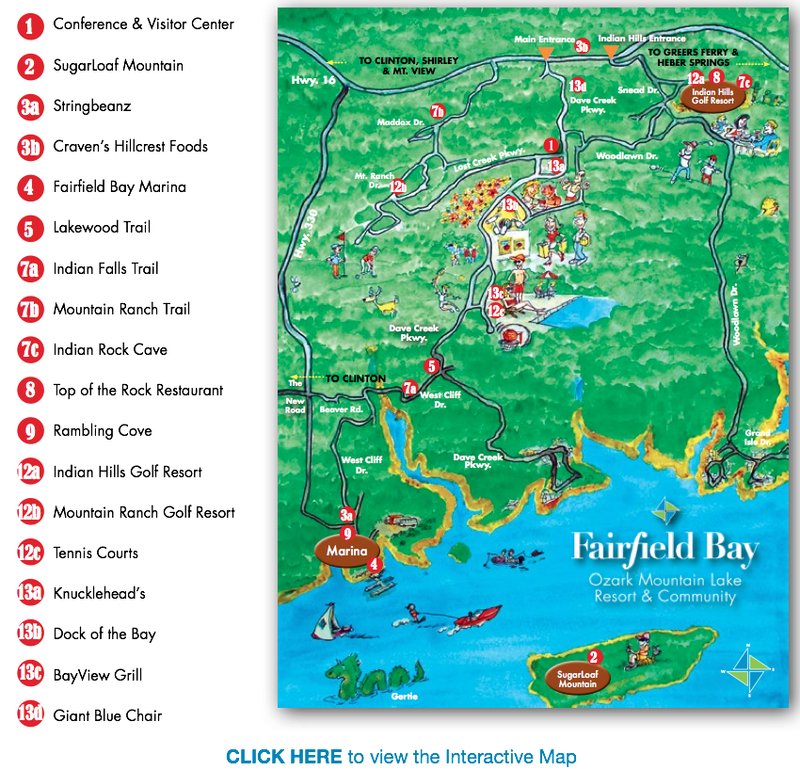 Take an aerial tour of Fairfield Bay Resort Community! Fairfield Bay’s recently renovated ‘Center’ is a conference, performing and visual arts center all in one. Your home base for information. Relax in the lounge or outside on the deck. Pick up some area information and maps, and get acquainted. Bay Conference, Arts and Visitor Center. 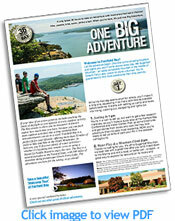 Pick up some brochures and get stories from locals who look like they love adventure (that includes most residents). NOW you’re ready to set up tents or park your RV in the lakeside campground. There’s no loafing for you. It’s off to SugarLoaf Mountain via boat ride with a great hike after you land. 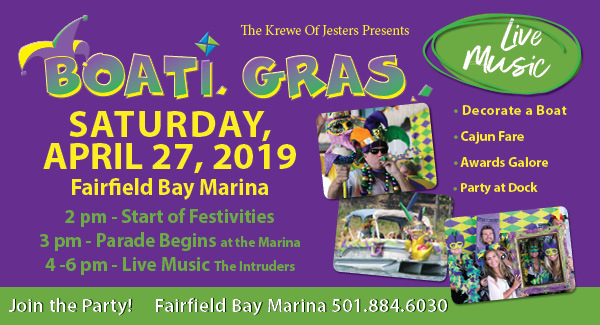 Head down to the Marina. Rent a boat, or better yet – a kayak…a great way to explore the lake and all its nooks and crannies. Gather maps and get more secrets from residents about the “must see” things to do around The Bay. If you need more supplies or snacks, you’ll find them there. For a close up of this experience, read the popular ArkansasOutside. Photo by Arkansas Outside.com A favorite adventure is hiking the historic SugarLoaf Mountain. There’s nothing quite like the total experience you take in when deciding to hike SugarLoaf Mountain. 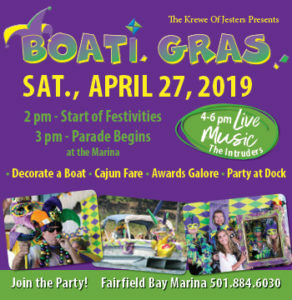 Take the shuttle from the FFB Marina, or rent a kayak and paddle out there to start the trip. It’s one of the nations first historic scenic trails, so don’t miss it. of bluffs. Look for boat tie-ups, including special ones for kayaks. Take your pick of where to hike. The Terrace Trail starts at the base of the shore, climbs up the bluff line and goes around the island (1.6 miles round trip). The Mule Trail goes from the start of Terrace Trail, slants to the top and bisects the level dome of the mountain (.5 mile across the dome). In years past, the climb to the top required a rock scramble, wedging yourself between rocks to access the top. Now there are steps (a lot of steps!) to take you to the incredible views of the lake. Attention Geocachers: This is the first of many chances to “treasure hunt” around The Bay. There are more than 6 million geocachers in the world, and it’s easy to become one, too. Still up for a short hike? Just do it…at the Rambling Cove Trail (1/2 mile). Starting at the big Razorback-shaped (and painted) rock, the trail is fairly flat with a slight slope down to the lake. 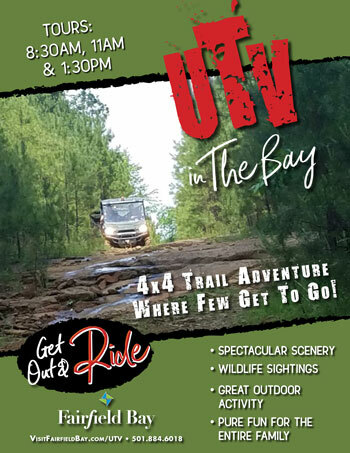 For more on The Bay’s trails visit our webpage. Back at camp, string up your hammock if you didn’t earlier. Some of your friends like hammocks because they’re trendy. You like them because they make sense. A handy place to catnap or get a good night’s sleep. The afternoon’s activities have surely built up an appetite! There are at least two choices: stay “in” and stoke the grill or go up the hill to Stringbeanz, a casual restaurant right across the street from the Rambling Cove Trail. You can’t resist the homemade desserts. If you forgot a few groceries, visit Craven’s Hillcrest Foods on Hwy 16. Stargazing is a year-round event at Fairfield Bay. 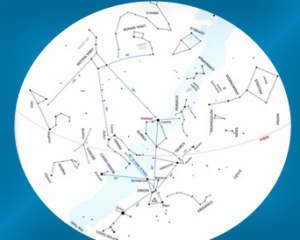 Enjoy the quiet study of the stars with a star map. See what constellations you can find. Sure to be many. Stargazing is a year-round event at Fairfield Bay. With minimal light pollution, stars seem to pop out of the sky. While Nature puts on its light show, you might want to enjoy the quiet, or study the stars. If you choose the last option, what should you look at first? Start with Orion. Search out the three equally bright stars in a row, which form Orion’s belt. Next, Taurus the Bull and then Ursa Major and Minor. Last stop is Andromeda. Almanac.com has a nice guide to finding the stars and constellations. A fun way to look at the stars is a stargazing app. Download Star Walk and point your phone toward the sky. As you turn, the image spins with you. Wake up to another day in paradise. Your day will be jam-packed full of adventures mixed with time to re-energize: hiking, biking, meals of course, and a stop for some Bay Brew. End the day paddling into the sunset followed by good ole s’mores. 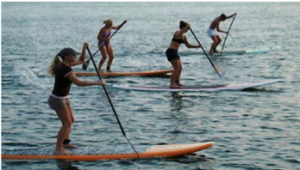 One of the fastest growing water sports in the world, Stand Up Paddleboards (SUP) are not only great fun, but a fantastic workout as well. It’s ideally suited for beautiful Greers Ferry Lake. Find your own special little cove to paddle and take in the beautiful scenery. a Stand-Up Paddle Board (SUP). This activity is without a doubt one of the fastest growing water sports in the world. It’s ideally suited to calm, flat water surrounded by beautiful scenery (sound familiar?). 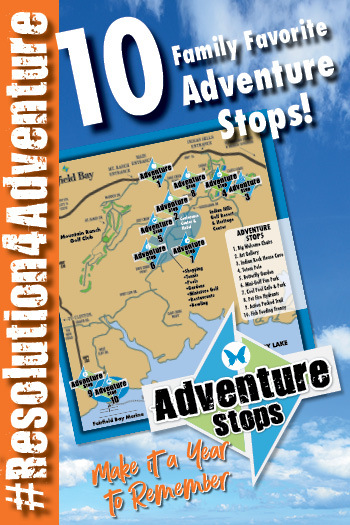 Now you’re fully warmed up for your next adventure on The Bay’s trails! The Lakewood trail is perfect for exploration by bike or afoot. Located across from the Methodist Church, allow two hours for this 6.6 mile trail with 800 feet of elevation change. That’s right, bring your hill legs! Make a point to see the waterfalls. Mosey over to the snack shack at the marina, where you’ll find a delicious and easy lunch. Then eat right there on the docks while enjoying the water and beauty of the day. The Bay offers so many trails, it’s hard to choose! Just up from the Marina is the Indian Falls Trail. This trail winds along Trail Creek and the rim of Wild Horse Canyon. The rock formations and two waterfalls make this a serenely peaceful hike. You’ll find a dirt road at the end of the trail that returns to a re-tracking of the original portion of the path. Take Dave Creek to the Methodist church. Turn right onto West Cliff and then, right onto West Cliff Spur. 8/10 mile; Moderate Trail – Note: hike on the bluffs above it or walk on the rim of the canyon. to 90 minutes for this trail. You won’t want to miss the two wide creeks and striking rock formations. Start at the trailhead located in the Mountain Ranch subdivision of Fairfield Bay. Geocachers and hikers, you’ll love the Indian Rock Cave, another fantastic formation containing several petroglyphs. A wooden walkway with steps leading down gives you fairly easy access to the 60-70 foot elevation change. The hike to the cave is short, but the trail continues on if you want to explore the many smaller crepuscular caves, slots and other rock formations. Wind down with dinner at The Bay’s signature restaurant, Top of the Rock. Take in the views from the deck as you sip a Bay Brew beer. If you have kids, they’ll love getting their dinner on a Frisbee…plate now, play later. A sunset on Greers Ferry Lake is a sight to behold. Snag a paddle boat from the marina and make your way to Rambling Cove. Bring some wine or sparkling water and sip as the sun slips below the horizon. Back at camp, cook up s’mores. Take some time to reflect on the day’s adventure; tell stories, journal, draw or do nothing at all! Finally, stretch out for sleep and allow the crickets to sing you a lullaby. is more to do than there is time. Don’t look at it as your last day here. It’s just a continuation of the adventure. You’re still on the move, having more fun and daydreaming about your return visit. Make notes on what you want to do next time! How should you start the day? Wake up slowly to the sounds of nature while you sip coffee,,, or grab a quick run before breakfast to get your blood pumping. The Bay’s flexible to your whim. 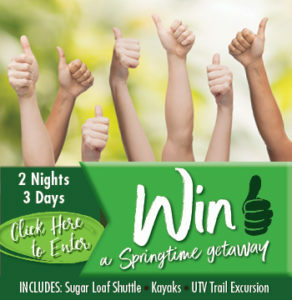 The green’s are calling! 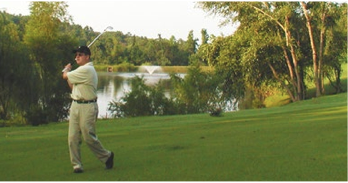 The Indian Hills Golf Course offers four sets of tees for players of all abilities to enjoy the natural surround- ings, as they make their way around one of the best kept secrets for championship golf in Arkansas. For you, adventure covers a lot of ground – sports being one. For a change of pace, play a round of golf at one of The Bay’s two stunning golf courses. Or, if hitting a tennis ball is more to your liking, check out the beautiful Tennis Center. Open 24/7, you can play tennis on eight courts (two of which are lit for nighttime play.) Book a lesson with a tennis pro! Join the locals on Tuesday, Thursday and Sunday, or opt for a private lesson. If you didn’t get to Rambling Cove, that’s a peppy hike not to be missed. The trail leads right to the marina. Look for the big rock shaped like a razorback. Now that you’ve worked up an appetite, treat yourself to a gourmet burger at one of The Bay’s great eateries. 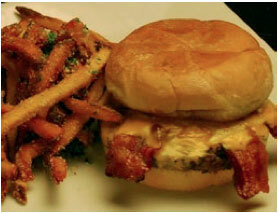 Knucklehead’s, Dock of the Bay, Top of the Rock or the BayView Grill all offer scrumptious burgers for the road. Then stop on your way out of town and grab a picture in the iconic Giant Blue Chair.